Some owners have experienced problems in obtaining smooth, progressive accelerator/throttle movement. A modification has been introduced to correct this. Details are shown below. We do not advise you to attempt this modification yourself unless you are familiar with mechanical work and have the necessary equipment for thread-cutting, etc. 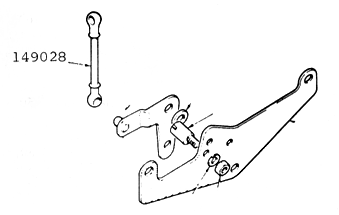 An improvement in this condition can be made by removing the connecting rod (part number 149028) which joins the bell crank lever and the carburetor spindle cross shaft, removing one ball and reducing the total length of the rod by 3/8", re-cutting the thread and re-placing the ball end to give a dimension of 2.75" to the centers of the ball ends. The original dimension of the connecting rod was 3.12" to the centers of the ball ends. The new dimension of 2.75" was introduced at approximate commission number KC 55500. It might be pointed out that the instructions wete incomplete in that after shortening shaft PIN 149028 it is necessary to make adjustments on the carburetor spindle cross shaft. I accomplished this by backing out the screws on the clamps on section 1 and 3 only of the cross shaft. This allowed the shaft ends to rotate upward and achieve idling speed, then tighten the clamp screws back down on the spindle cross shaft. Comments on "Service Bulletin: GT-6+ Throttle Modification"
The plastic ends on the throttle connecting rod fail over time. If yours still work, you're lucky. I believe the part has been discontinued.